The Utility Workers Union of America sought a way to reenergize its membership in the face of constant attacks on unions by state governments. 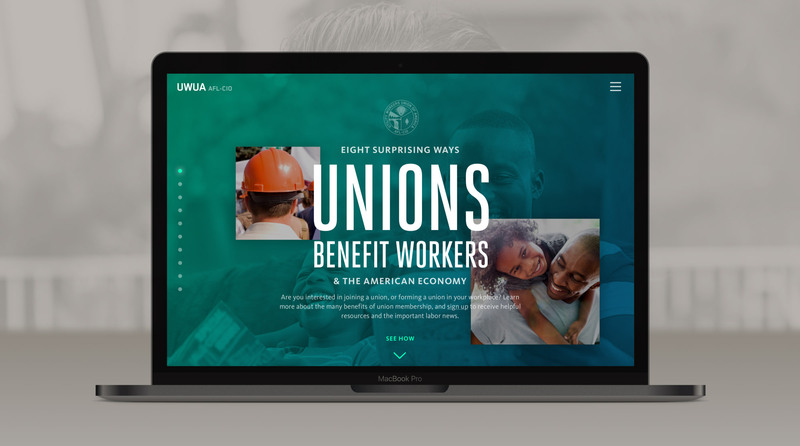 The firm Mood & Method worked with UWUA to develop a strategy and a series of messaging campaigns to reinforce the importance of unions in the American labor market. The Eight Ways campaign highlights eight ways in which unions support a vibrant middle class, reduce government dependency, and create a safer working environment for all workers. The site I developed for this campaign consists of a long-scroll, takeover screen presentation outlining all eight ways, along with second template that presents more detail on each. Website for a platform for publishing vibrant interactive reports, created by my friends at Constructive.